(P1) Look, no one wants to miss their flight, but sometimes you just have to deal with it. The Guardian reports a man was late for his flight from Madrid to the Canary Islands on Friday. 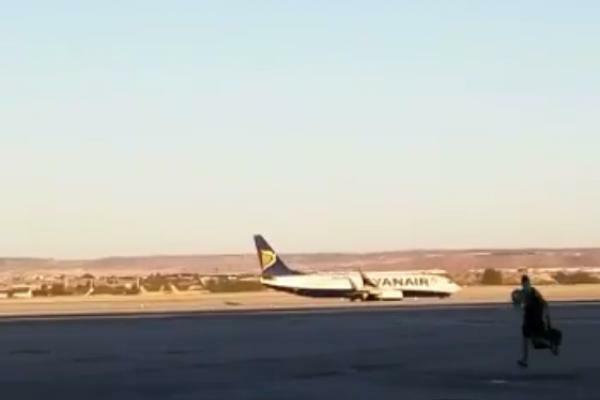 Instead of giving up, he ducked out a fire escape and chased a Ryanair plane down the tarmac. (P2) The whole thing was caught on video and posted on Facebook. Workers stopped the man before catching the plane, which was actually the wrong one. He still somehow managed to get onto his flight, according to CNN. He was arrested upon landing in the Canary Islands. Do you think this man is crazy? Why or why not? What would you do if you were late for a flight? Do you think he should have been arrested on the tarmac? Why or why not? Where did the man travel to? How did the man get on the runway? What is the name of the airline he was flying on?